...the category wasn't levidromes. Jeopardy! had their Teen Tournament games between November 7 and November 20, 2018. In their 10th game of the competition, Jeopardy! had a category called "Forwards and Backwards" in their double jeopardy round. In this category, they would show the answer and then ask for a pair of words for the question. Alex Trebek, the host for Jeopardy! described the "Forwards & Backwards" category as "We'll need 2 words for each response, and each one will be the reverse of the other". 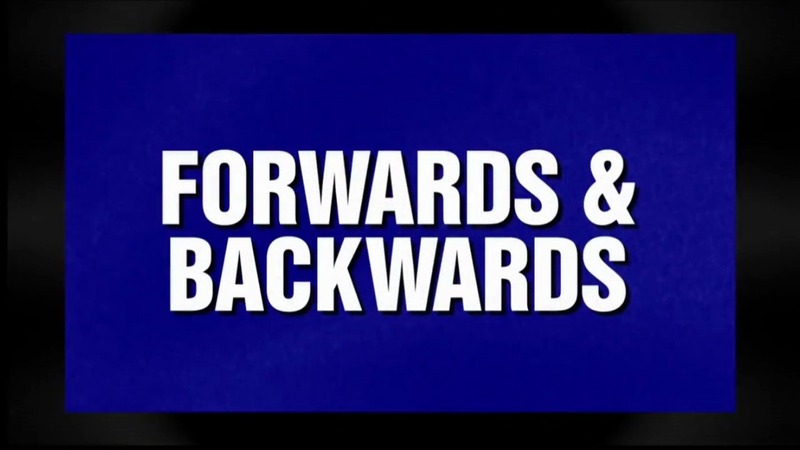 Since there isn't a formal definition for "Forwards & Backwards" words, Jeopardy! opted with just calling the category "Forwards & Backwards". This was a classic levidrome category. We think it is time for Jeopardy! to start using the word levidromes. After all, there is a word for these backwards type of words. I suppose we can let it slip for the older shows because levidrome wasn't even a word yet. (Heck, Levi was not even born yet for most of the episodes). But anything going forward, it should be levidromes.